Let’s learn how to make delicious mumallaengi-muchim today! It’s a Korean banchan (side dish) that’s very common in a Korean dosirak (lunch box). The main ingredient is mumallaengi – Korean white radishes, cut into pieces 3-4 inch long and ¼ inch thick and dried in the sun. You can buy packaged mumallaengi in Korean grocery stores. A few tips for this banchan: don’t soak it in water too long, because the radish will lose its delicious flavor. 7 to 8 minutes is perfect. Don’t forget to wash and rinse the radish a couple of times to remove any remaining dirt and to make the radish a little softer. Another tip, as you see in my video, is to stir-fry it with vegetable oil for 1 minute so that it gets more plump and keeps its beautiful red color and springy texture. Good luck with this recipe, I hope you enjoy it! Wash and drain the mumallaengi in cold water a couple of times. Soak it in cold water for 7-8 minutes. Strain and squeeze out excess water. Heat up a pan over medium high heat and sauté the mumalaengi with 1 teaspoon vegetable oil for 1 minute. Remove from the heat. Set aside. Combine garlic, green onion, fish sauce, hot pepper flakes, rice syrup in a mixing bowl and mix it well with a spoon. Sprinkle with sesame seeds. Transfer some to a serving plate and serve as a side dish with rice. The leftovers can be stored in the fridge up to 1 month. Posted on Thursday, May 23rd, 2013 at 2:02 pm. Last updated on October 6, 2014. Posted October 9th, 2016 at 1:20 pm | Log in to reply. The thing that hit me first when I first made this was the smell when I opened the Radish. IT WAS SO GOOD! I wanted to sit down and just enjoy the smell. Posted June 30th, 2016 at 8:10 pm | Log in to reply. I made this dish and it tastes great. I do have a question though. I followed your directions, is the dried radish still supposed to be a bit hard in the center? It makes me wonder if I should have soaked them longer than 8 minutes, but I’m not actually sure what the texture should be since I’ve never had this before. Posted July 7th, 2016 at 9:06 am | Log in to reply. It should be chewy but not hard. So try soaking a little longer, but not too long or it will looks its flavor and chewiness. Posted October 9th, 2016 at 1:23 pm | Log in to reply. I find that the soaking part is kinda tricky. Try chewing a couple of pieces before you drain it. You want it pretty firm, as that’s part of the joy in eating the finished dish. I also have seen several brands that might each absorb moisture at different rates. In Northern CA, I am lucky to have a Costco-size market called Koreana Plaza in Sacramento, so I have a great selection. Maangchi, can you recommend a brand? Posted October 18th, 2016 at 5:20 pm | Log in to reply. Your explanation is awesome! I don’t have any particular brand that I prefer. I usually pick one with a clean, light color, and well dried. I avoid anything brownish. Posted June 3rd, 2014 at 9:02 am | Log in to reply. I have fall in love with this side dish… Would like to check if i do not have rice syrup can i replace w honey or brown sugar? Can i use hot pepper paste? Posted June 4th, 2014 at 9:43 am | Log in to reply. I would use honey or white sugar. Brown sugar may make it brown. Yes, you can use hot pepper paste, too. Good luck! Posted June 5th, 2014 at 8:20 am | Log in to reply. Posted October 9th, 2016 at 1:18 pm | Log in to reply. I have been successful using White Karo Syrup since I have very little actual sugar around, and it seemed fine. Posted August 29th, 2013 at 11:03 pm | Log in to reply. We are making in the process of making this dish! Posted June 30th, 2013 at 3:38 pm | Log in to reply. My local Hmart has this dish for sale, and they have this type of leaf in theirs….would you know what that leaf is? I want to make this dish with the “leaf” in it. Posted June 30th, 2013 at 7:25 pm | Log in to reply. oh the leaves are from green chili peppers. The leaves from green chili peppers are picked, blanched, and dried. They are called “gochunnip”(고춧잎). 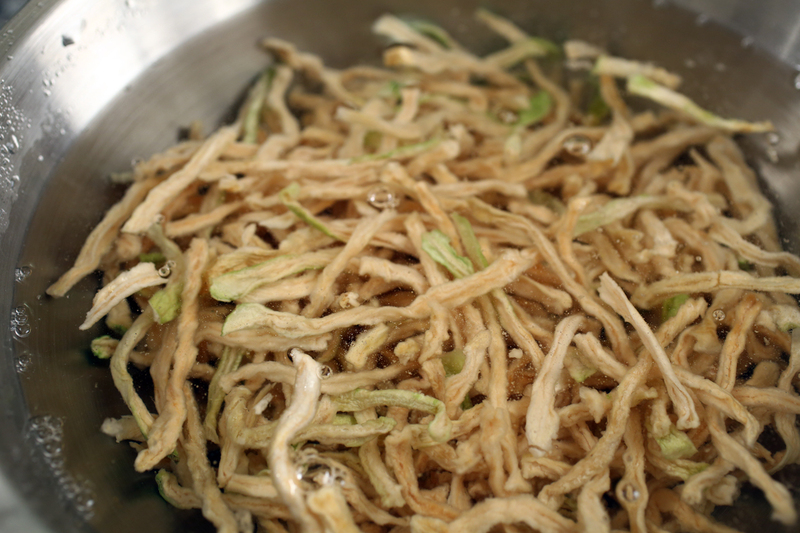 Mumallaengi (dried radish strips) is often seasoned with gochunnip. Good stuff! If you want to make it that way, simply soak the leaves with dried radish together. Posted June 17th, 2013 at 12:17 am | Log in to reply. I just bought a package of dried radish strips from a Korean market. On the package direction, it says to soak the radish strip for 1 hour. Should I ignore the package soaking time and follow as you suggest 7 to 8 minutes? Posted June 30th, 2013 at 7:26 pm | Log in to reply. Posted June 6th, 2013 at 9:38 pm | Log in to reply. Can you show us how to make the rice in this video? I remember when I studied abroad in Korea, I fell in love eating that rice. Thanks much!! Posted June 30th, 2013 at 7:29 pm | Log in to reply. Posted May 31st, 2013 at 3:18 pm | Log in to reply. I used red pepper powder instead flakes and the taste came out a little sour and bitter. Since powder is more dense than flakes, I assumed I added too much powder. Any suggestions or comments? Thank you for this awesome site and I am falling in love with it. Posted June 1st, 2013 at 10:37 am | Log in to reply. Either red pepper flakes or powder shouldn’t taste sour and bitter. Check out the expiration date please. Good luck with your Korean cooking! Posted May 29th, 2013 at 8:13 pm | Log in to reply. This looks a lot like the bellflower recipe. Loved the taste. Does it kind of taste the same? Will have to try to make it. Have you seem the U tube comments? Lol , they all want to know how you make the black rice. Oh, me too!! me too!! Posted May 30th, 2013 at 1:17 pm | Log in to reply. Bellflower roots salad tastes sweet and sour because vinegar is used. But mumalaengimuchi doesn’t use vinegar and uses fish sauce. They are different taste. Posted May 26th, 2013 at 1:30 am | Log in to reply. Posted May 26th, 2013 at 7:11 pm | Log in to reply. Posted May 26th, 2013 at 12:32 am | Log in to reply. Yay! I’ve been wanting a good recipe for the dried radish in my cupboard. Posted May 24th, 2013 at 10:20 am | Log in to reply. Thank you so much for this recipe. I’ve been yearning for this kimchee for so long. Now, I just hope that the kmart here sells this dried radish. Can’t wait to try making it. 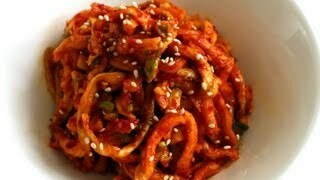 Btw, can you please upload a video on dried bell pepper kimchee in the near future? Posted May 25th, 2013 at 10:49 am | Log in to reply. 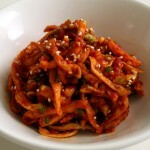 I have never heard about dried bell pepper kimchi. Posted May 23rd, 2013 at 2:20 pm | Log in to reply. How did I not know that they sold packaged dried mu. Knowing that would have made things so much easier for me and my mom. My mom used to make this by julienning fresh radish and waiting until they dried out naturally. The process took months! But then I bought her a dehydrator and now she can make it any time. Thank you for the recipe! Posted May 25th, 2013 at 10:51 am | Log in to reply. “My mom used to make this by julienning fresh radish and waiting until they dried out naturally.” Your mom must be a good cook! This recipe was originally posted on May 23, 2013 at 2:02 pm by Maangchi. It was last updated on October 6, 2014. The video was watched 313,302 times on YouTube & has 2,973 likes!